Arlene has come up with some neat samples of recycling, reusing or repurposing to give us some ideas for the June challenge.... look at these beauties. just click on the photo to go to her photostream to see how she did these. I read on the Hero Arts blog of May 13, 2011 that Hero Arts won a 2011 Small Business of the Year award for their sustainability and green business. 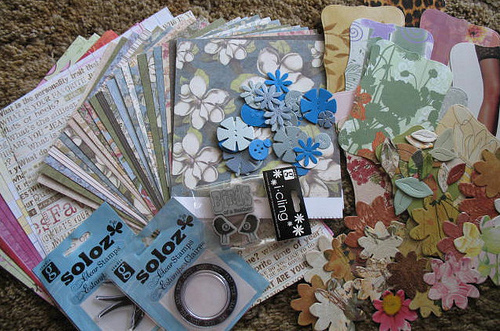 I know a lot more people recycle, re-purpose, or reuse items, whether it's wood planking from an old farmhouse or a doily for an embellishment on a card. I had already thought of my challenge for the Die Cut Divas flickr group challenge early in the month, but it still needed firming up. No matter what type of recycle, re-purpose or reuse of an item, the card must have a die-cut or be embossed with your machine. Any type of machine is fine. What kinds of things can be reused, recycled, re-purposed? I use tissue boxes all the time as well as packaging for stockings for die-cuts. 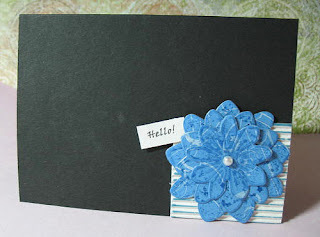 I love the idea of doilies, buttons, or stick-pins for flowers making the card scene. I now have a great button die that I love to use because it's not as thick and heavy as a real button. How about turning ribbon into flowers? Yes, that's not recycled, but it is re-purposed. Have fun! I am publishing this early as I have been locked out of my desktop for about a week and I want to make sure I can get this up and running.